Veeam Backup & Replication Community Edition [formerly known as Veeam Backup Free Edition] is a must have FREE tool for ad-hoc virtual machine (VM) backup, restore and management in VMware vSphere and Microsoft Hyper-V virtual environments. With no agents to deploy, powerful recovery options and VeeamZIP, you get flexibility in options and a reliable solution for important VMs. 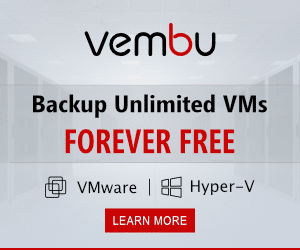 Whether you are locked in a legacy backup contract or are operating within a tight budget, you’ll find this FREE VM backup software helpful for your daily VM management. 1 Why use Veeam Backup & Replication Community Edition? Why use Veeam Backup & Replication Community Edition? Even for small infrastructures, virtualization with either VMware ESXi or Hyper-V brings many benefits in terms of savings and ease of administration. Have you ever wanted to back up a VM before making changes to it, clone a VM for testing purposes or make a compressed data archive prior to a VM decommission — just in case? Veeam’s FREE backup tool will cover all your needs! Veeam Backup & Replication Community Edition works perfectly with both standalone ESXi and Hyper-V hosts, as well as with large virtual deployments. Whether you run a test lab or a production environment, it’ll be a perfect match. Easy-to-use: No complicated configuration and no need to power off the VM — It Just Works! 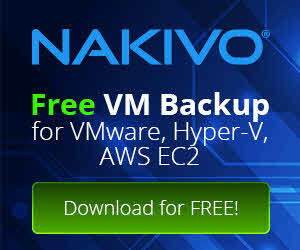 FREE: Unlimited number of ESXi and Hyper-V hosts or VMs, with no expiration date and zero investment required. Usually, free backup tools provide very little value and are limited in time or volume. This is not the case with Veeam. Built for virtualization admins, Veeam Backup & Replication Community Edition is packed with powerful management and recovery features with no hidden tricks, gimmicks or fees. VeeamZIP your VMware and Hyper-V VMs with Veeam Backup & Replication Community Edition! VeeamZIP fully encapsulates the VM and makes live ad-hoc backups. VeeamZIP captures all the virtual disks and configuration files needed to restore a VM on any ESXi or Hyper-V host, and even maintains thin-provisioned disks. Veeam Backup & Replication Community Edition comes with a full range of restore options, including full VM restore and granular Instant File-Level Recovery (IFLR). Moreover, you can also look inside the VM backup and restore individual guest files. IFLR is available for 19 file systems, including Windows, Linux, Unix, BSD, Mac, Solaris and Novell all for VMs on vSphere and Hyper-V.
With the loss of NTBackup and its exclusion from Windows Server Backup (WSB), you’re missing a key piece of your IT toolbox. Perform vSphere backups faster and with reduced impact on your virtual environment by backing up directly from file-based (NFS) primary storage using Veeam’s proprietary NFS client.